Piqua, Ohio, July 11, 2018 – Propellers will be everywhere at EAA AirVenture 2018, to be held July 23-29. With more than 500,000 Hartzell props manufactured and flown over the past one hundred years, it is a sure bet that attendees of Oshkosh’s famous fly-in will see and experience the company’s leading aerodynamic and technological advances. Anchoring Hartzell Propeller’s presence at this year’s massive general aviation gathering will be the company’s exhibit, staffed by propeller experts, where the company will host a series of technical talks ranging from choosing a propeller for experimental aircraft to proper propeller care and maintenance. Hartzell will once again be at the center of the action by sponsoring several exciting flying demonstrations, as well as co-sponsoring a growing Pilot Proficiency Center. At its exhibit, Booth 296-297 in the Main Aircraft Display Area next to the EAA AirVenture Welcome Center, Hartzell will feature its range of two-blade though five-blade constant speed aluminum and structural composite propellers that provide highly reliable and maximum performance to thousands of pilots around the world. On display will be Hartzell’s 2-blade composite Trailblazer, 3-blade Bantam and Raptor applications, 4-blade aluminum and composite options, and 5-blade carbon fiber propellers for various aircraft models. The 2018 Pilot Proficiency Center (PPC), co-sponsored by Hartzell Propeller, will give pilots of all skill levels a chance to advance their aviation abilities, provide networking opportunities, and familiarize EAA members with the proficiency tools and resources available during EAA AirVenture. New additions to the PPC include a personalized post-flight debrief provided by CloudAhoy after each simulator flight, an informational kiosk educating attendees on at-home and year-round proficiency training, and scenarios customized to pilot experience and recent activity. 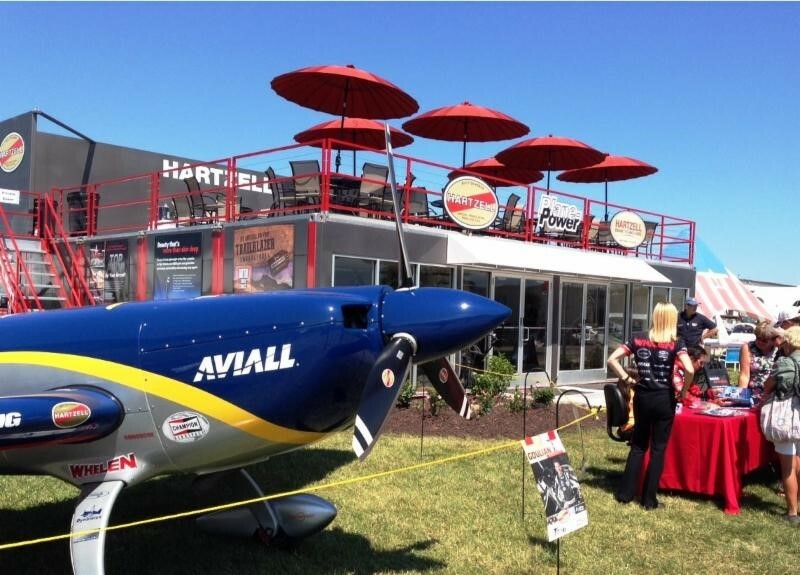 In addition, the AOPA Proficiency Café has been expanded to five days from July 23-27. Returning features include a CFII-hosted simulation center with 14 LD simulators and an Xwind Trainer provided by Redbird, a full schedule of tech talks presented by Jeppesen, and the opportunity to earn FAA WINGS credits on all activities. The PPC is located at the southeast corner of the EAA Four Corners, just west of Boeing Plaza and close to the Hartzell Propeller booth. For additional information, visit www.EAA.org/PPC. To find information on specific simulator scenarios and to debrief ahead of time, visit www.EAAPilotProficiency.com. Props by Hartzell Propeller are standard equipment on many of the world’s leading piston and turbine airplanes and are used extensively by backcountry fliers and experimental aircraft builders, the heart and soul of AirVenture. Attendees can encounter precision flying by professionals that choose propellers from Hartzell, for their unmatched performance, reliability and durability. Beginning its second century, Hartzell Propeller is the global leader in advanced technology aircraft propeller design and manufacturing for business, commercial and government customers. The company designs next generation propellers with innovative “blended airfoil” technology and manufactures them with revolutionary machining centers, robotics and custom resin transfer molding curing stations.